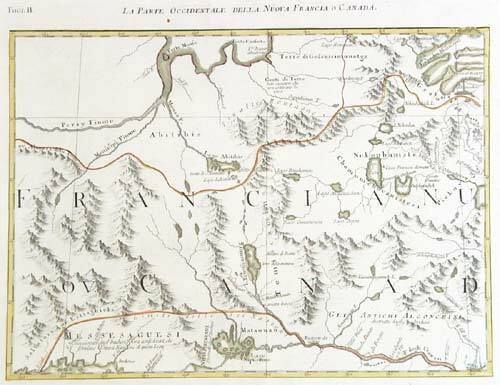 Paris, Dezauche, 1783. A large and colourful map, published soon after the American Revolution. London, 1846. 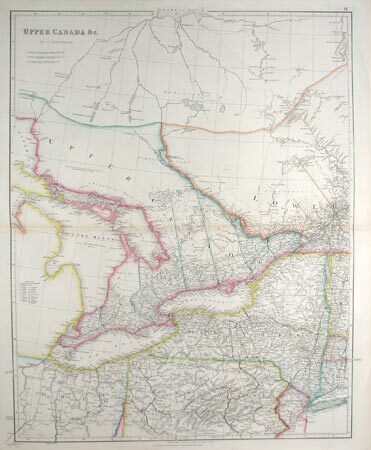 Detailed map of the area around Lakes Huron, Erie & Ontario, with Upper Canada, New York State, etc. Compiled for the 'London Atlas' by Arrowsmith, the foremost British cartographer of his generation. 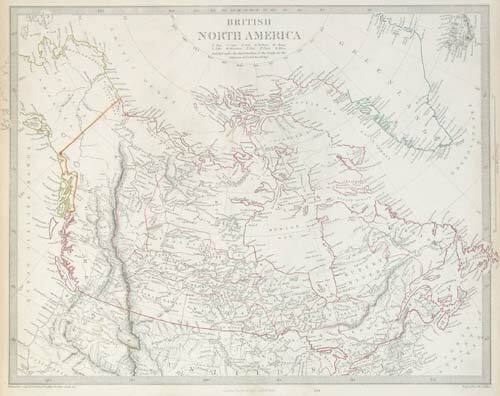 London: Charles Knight, 1852, Canada map, with Alaska still marked Russian America. Edinburgh & London: William Blackwood & Sons, 1856. Large and detailed map. Liverpool, 1856. 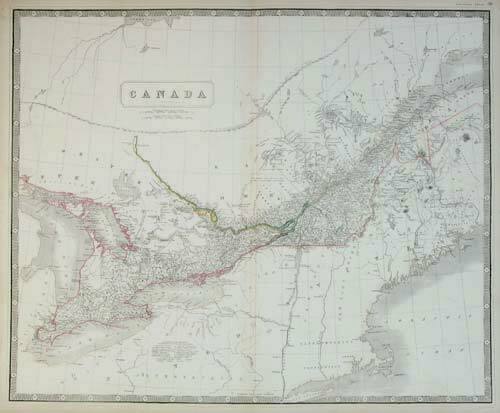 Large and detailed map of Canada in fine colour, with an inset of Newfoundland. Paris, 1757. 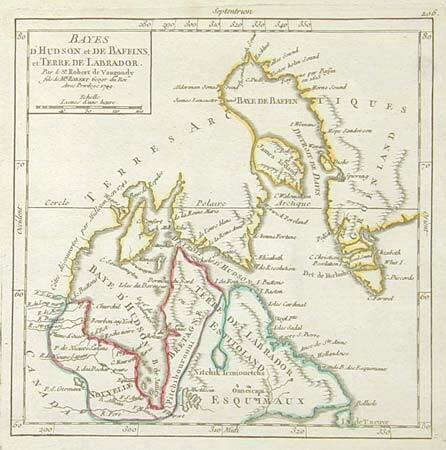 Hudson's Bay & Labrador, marking the places found by the early English expeditions trying to find the North West Passage. Paris, c.1753. 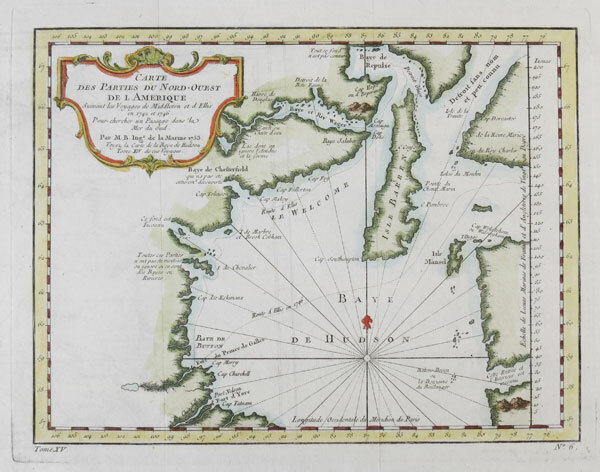 Hudson's Bay, marking the routes of Middleton & Ellis in search of the North-West Passage. 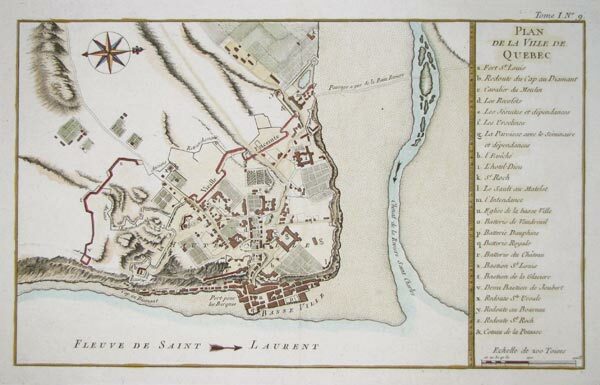 Paris, Lattr�, 1772. Northern Canada, marking Belle Isle, Baffin & Hudson Bays and Greenland. 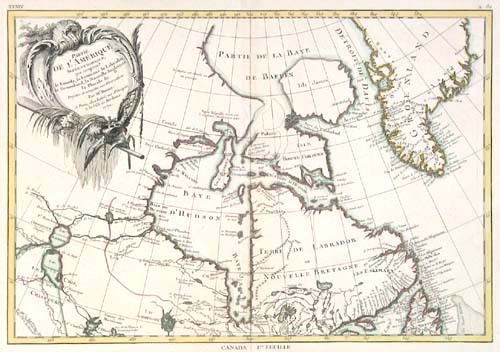 The western tributaries of the Hudson Bay were still regarded as the most likely North West Passage. Venice, 1778. 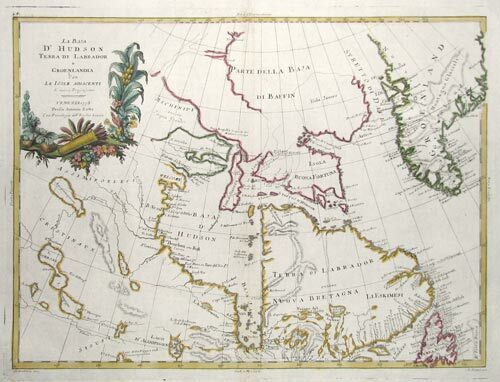 Hudson's Bay and southern Greenland, with 'Michinipi', the supposed entrance to Zatta's North West passage. Amsterdam, 1600. 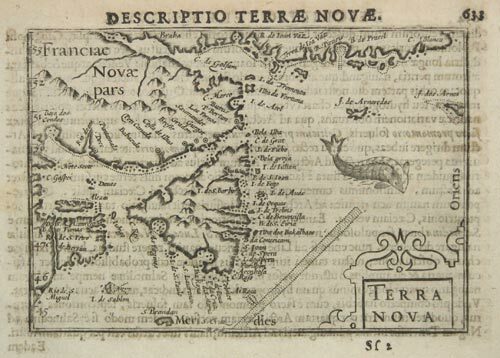 Newfoundland, with the coasts of Quebec and an unrecognisable Nova Scotia. Sable Island and the Grand Banks are marked, as is 'S.Brandan', the island supposedly discovered by an Irish monk in the sixth century. From Bertius' 'Tabularum Geographicarum Contractarum'. London: Dangerfield, c.1885. 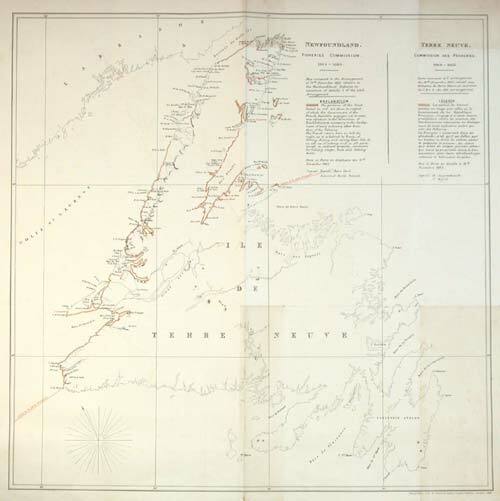 Map issued to illustrate a treaty dividing Newfoundland's fishing between the British & French. The north coast from Cape de Raye and Cape St Jean was reserved for the French fishing industry (but open to all non-fishery related industry). c.1816. 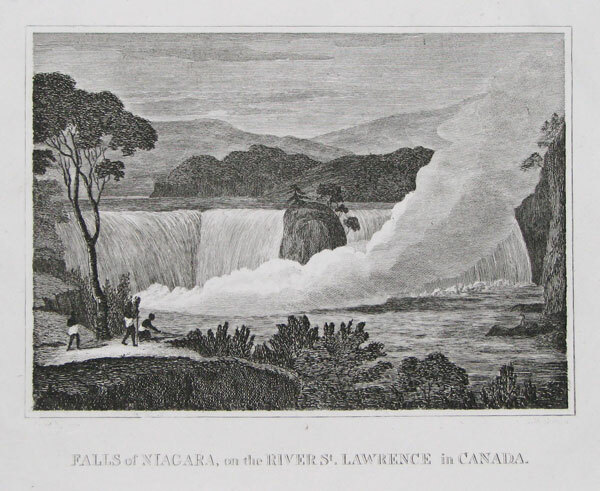 A view of Niagara Falls from the Canadian shore. London: Baldwin & Cradock, 1832. 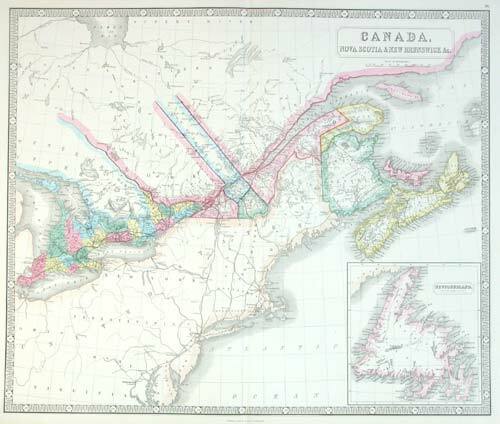 Map of Nova Scotia and Lower Canada. Paris, 1764. 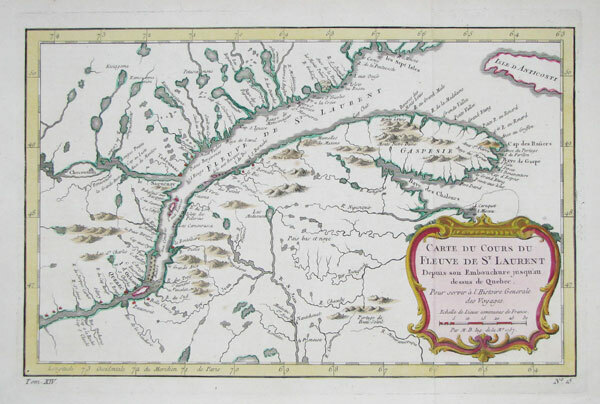 The uncommon larger version of Bellin's plan of Quebec, only issued this one time. Published only five years after the loss of the city to the British under Wolfe, it makes no reference to the defeat. Venice, 1778. 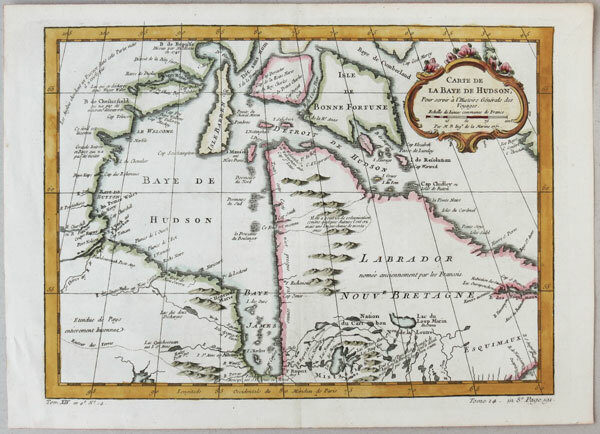 One sheet of a 12-sheet map of North America, showing Quebec between Montreal and James Bay, much occupied by the Six Nations Tribes, including the modern Parc de la Verendrye. Paris, 1754. 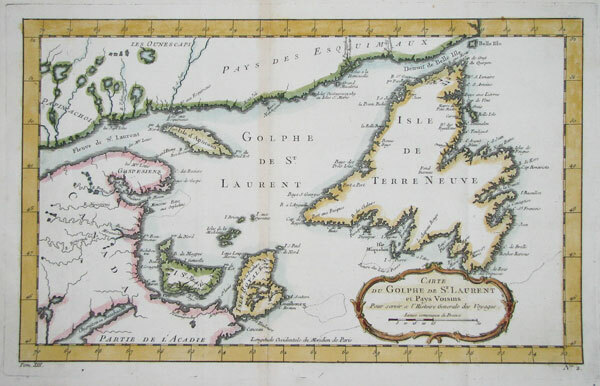 The Gulf of the St Lawrence, with Newfoundland. Paris, c.1760. 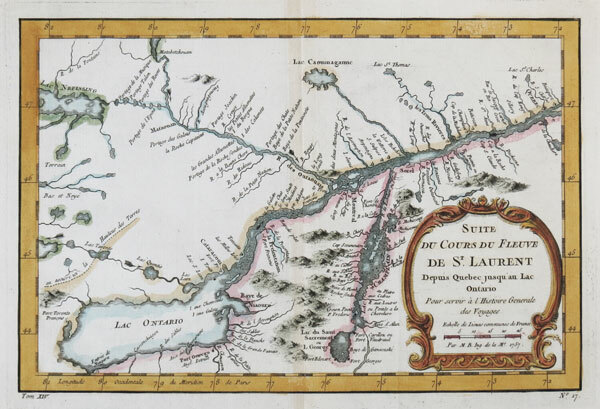 The St Lawrence From Quebec to Lake Ontario, showing Montreal. Paris, c.1760. The St Lawrence inland to Quebec.